Bonuses: The territories marked in yellow are the regions' capitals. The bonuses for holding them are as follows; 4 = +1, 5 = +2, 6 = +3, 9 = +5. Version 1.19 - New format for the title and redesign of the map legend and bonus boxes. 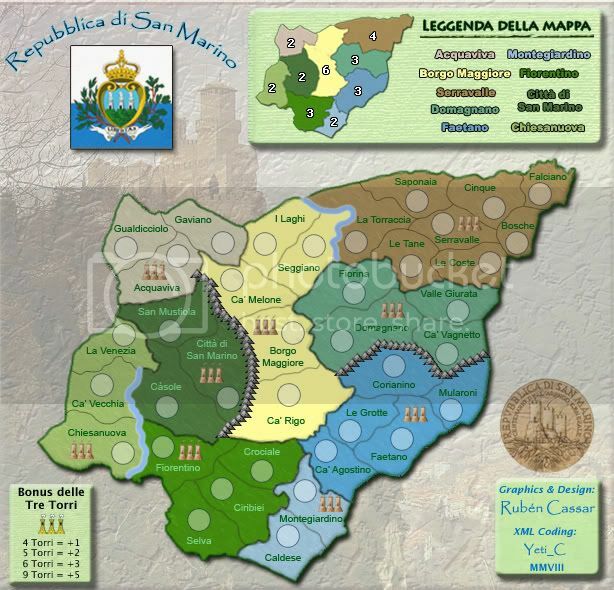 Version 1.18d - New rivers, added bridge between Chiesnuova and Fiorentino, replaced mountains between Faetano and Domagnano with a river, made Faetano slightly darker. Last edited by AndyDufresne on Thu May 28, 2009 12:49 pm, edited 65 times in total. I love it already & way to go Ruben for another map! Malta was a fine addition. I love all the small bonus regions on a 36 territ map. Cool ocean - is this the direction your headed for the water/background? Cool colors, although you may need to switch the greens up a bit as without a minimap for a legend, people may get confused. And I know you are working on the borders, but as you know - it's a huge deal here. Your territ borders look great, but th main outer is a bit jagged. RjBeals wrote: I love it already & way to go Ruben for another map! Malta was a fine addition. I love all the small bonus regions on a 36 territ map. Cool ocean - is this the direction your headed for the water/background? Cool colors, although you may need to switch the greens up a bit as without a minimap for a legend, people may get confused. And I know you are working on the borders, but as you know - it's a huge deal here. Your territ borders look great, but th main outer is a bit jagged. I might actually add a mini map if it make things clearer although perhaps two of the green shades are a bit too similar and need changing. Actually the background is not the sea...I just wanted to add something with a light green shade to be pleasing on the eye. How can I fix the outer edge of the main border? Any suggestions? I was also thinking of adding a regional capital for all of the 9 territories and give bonuses when you hold like 6 or more but I don't know if that would detract from the gameplay. Perhaps I'll make a poll on that one. E.g. : 6 cap +1, 7 cap +2, 8 cap +3 and all cap +5. Hehe that's interesting. Care to elaborate a bit more on what you mean exactly? Also is this a bad thing or a good thing? Ruben Cassar wrote: Actually the background is not the sea...I just wanted to add something with a light green shade to be pleasing on the eye. Duh - I knew that.. I must have still been thinking Malta in my head. I have San Marino on my own Italy map! But I do like the background. As far as the outer borders - let me think about it. I'll post something soon. I know what you mean. 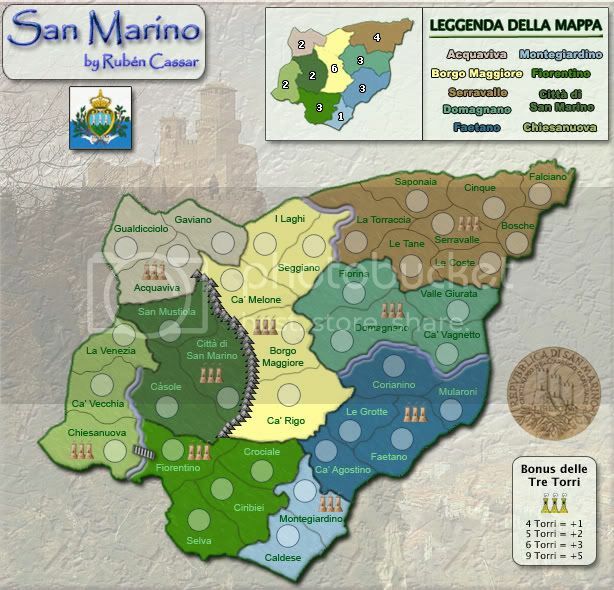 If there had been two or more countries surrounding it I would have gone for that option, but San Marino is totally engulfed by Italy. Don't think it makes much sense in this case. Germany is being revamped maybe you'll like it more now. Ok I posted another update. Let me know what you think about the special bonuses guys. I'm not really for the bonus regions. Personally I would never try to capture all capitals. I would go for the bonus region and then start to fort and attack out. And.. The plain tahoma text wth a 1px stroke (black / white) worked for the malta map very well, but it looks too fake here. I cant see the map, but the comments say they're good! edit: nvm, it works now that i opened the image in a new tab. Looks good so far! The only things i dont like are the mts, they are kind of small. That's really a personal preference though, so it really doesnt bother me too much. 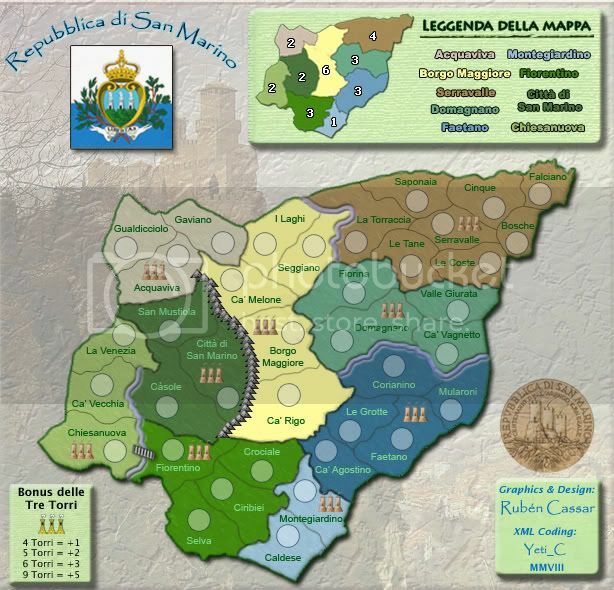 Its also kind of hard to see the borders in Citta di San Marino because of the dark texture and faded borders. I like the nice, simple, crisp style! but this is only a second draft and it looks fantastic! Ok guys I have an updated version ready which I will probably post later on today. I added the mini map and bonus legend. I am reading your comments and evaluating them but I will see what other people have to say before making any other changes. 1. About the mountains it shouldn't be a problem to make them bigger. Waiting for more feedback from other users. 2. The font can be easily changed. Personally I don't mind it but I'll wait for feedback from other people to see what to do. 3. The bonuses. I have been thinking a lot about them. I think I'll keep them. I believe that they add a new element to the map. Many of the territories are small and easy to hold. However a player can make a comeback perhaps if he manages to hold the yellow territories even though he doesn't have a regional bonus and this adds another strategic element to the game. Also the fact that you need at least 6 of them to get a 1 unit bonus prevents the yellow territories bonus from being a random thing but something that a player must work for. If anything my question is this...does the bonus starting from 6 territories seem too harsh and perhaps needs to be lowered to 4 or 5 or is it fine as it is? Again waiting for more comments. I like the mountains. They do not need to resemble real mountains - these kind of feel more like game board pieces, but its still cool. My vote is to keep them as is (or close to it). RjBeals wrote: I like the mountains. They do not need to resemble real mountains - these kind of feel more like game board pieces, but its still cool. My vote is to keep them as is (or close to it). Ruben Cassar wrote: However a player can make a comeback perhaps if he manages to hold the yellow territories even though he doesn't have a regional bonus and this adds another strategic element to the game. Yes, but the actual river is located in that location. I will add bridges so that there won't be any confusion. Remember this is still not finished, but thanks for pointing that out. Besides as a side note every CC player should get BOB. 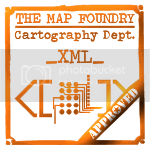 It's great and it solves these kind of problems with maps. On a separate note the free space will be used and yes San Marino is an actual place. It's in the Italian peninsula. I remeber you where the reason I got portugal so far. Hehe thanks mate. I am glad I was of assistance on that one. Portugal is a lovely map I must say. I have been busy these past months. Just finished my thesis and have my final university exams coming up in early June. I will have a bit more free time from mid June onwards to dedicate to CC.